Just in time for 31 days of gooey goodness, author Amy Ettinger has published Sweet Spot: An Ice Cream Binge Across America. She discussed her book last week on the public radio show, Marketplace, with host Kai Ryssdal, and talked specifically about frozen custard, a delicacy almost unique to Milwaukee. Milwaukee is known as Brew City thanks to its once-prominent beer-brewing tradition, but the city has another claim to fame: frozen custard capital of the world. Here, names like Leon, Gilles, Kopp and Culver are as well known as Miller, Best, Blatz, Pabst and Schlitz. And often they conjure deeper memories and stronger opinions than their beer-brewing counterparts. And while beer-drinking culture is reserved for adults, Milwaukeeans of all ages indulge in the passion for custard. McCann and Tanzilo ask why Milwaukee became custard central. Numerous ideas have been floated over the years as contributors to the "perfect storm" for frozen custard's adoption here, among them Wisconsin's dairy tradition, access to fresh cream and the proximity of the University of Wisconsin-Madison's Dairy School, believed to be the first of its kind in the Western Hemisphere when it began offering dairy foods courses in 1890. 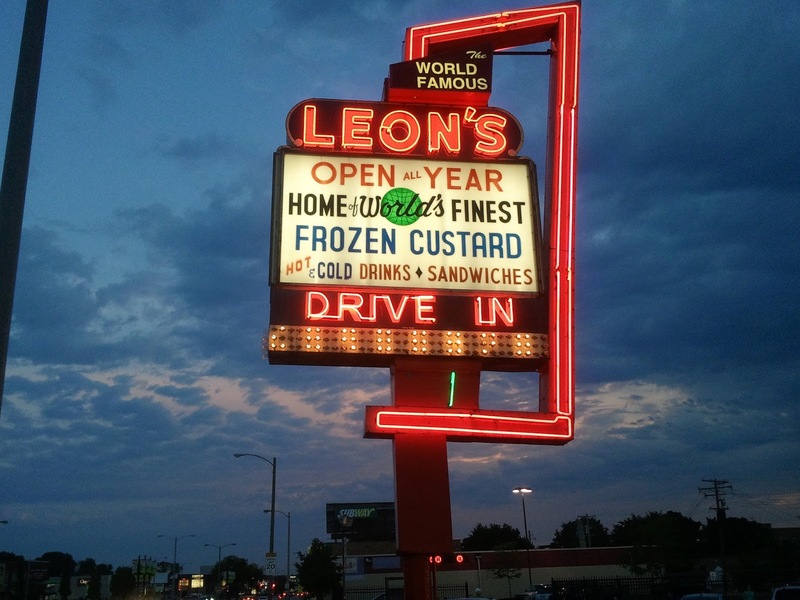 Leon Schneider, of the eponymous Leon's Frozen Custard, also worked as a custard machine salesman and, later, manufacturer and repairman. Between Joe Clark [who opened the first custard stand in Milwaukee], who wanted to do a good job; Paul Gilles [Gilles founder], who also wanted to do a good job. My father, Leon Schneider, taught many people about the custard business: Elsa Kopp, [founder of Kopp's], for one, Al Lach [who started Al's Drive-In], the Town Pride stores, the owner of Trudy's. He would welcome the competition. He felt that the more people who did a good job with the product, the more the product would become known. This would help us. A bad store down the block does us no good, because if at the first place the customer stops to try frozen custard, he eats lousy product, when he's driving by here, he's not going to stop. They say, "What's the big deal? It wasn't any good." We had more frozen custard stands in this area, geographically, than anywhere else. [But] why I firmly believe this area became the custard capital, if you will, is because there was good product; there was more of it than anywhere else. Karl Kopp, who owns two of the most popular stands in the area, thinks Schneider might be correct. "Maybe it's the fact that we have a lot of good ones," he muses. "They didn't dilute it. They kept it. I think that's what kept it going here. Guys were pure and didn't bastardize it." Frozen custard, like frozen yogurt, can be found on the East Coast, of course. Take Kohr Brothers, a popular frozen custard stand in Rehoboth Beach and other oceanside resorts, for instance. But it's hard to find authentic, Wisconsin-style frozen custard that evokes the childhood memories of Gilles or Leon's or Milky Way (inspiration for Arnold's drive-in on the 1970s TV hit, Happy Days). One exception -- perhaps the only exception -- is the Dairy Godmother in the Del Ray neighborhood of Alexandria, Virginia, near Washington, D.C. The store was founded by Wisconsin native Liz Davis, daughter of former Ninth District Congressman Glenn Davis (R-Wisconsin), from the days when Wisconsin had nine congressional districts. In its decade and a half-plus in business, the Dairy Godmother has been visited by VIPs like former Wisconsin Governor Tommy Thompson and former U.S. President Barack Obama and his family. And to her customers. Liz invested in a $70,000 frozen custard machine from Kiel, Wis., perfected her art and watched Del Ray gentrify around her. Despite Davis's decision to sell the Dairy Godmother, it is not closing. Local restaurateur and chef Russell Gravatt has bought the place and plans to continue operating it under the same standards. One of those standards has to be favoring the eating of the frozen custard on premises. It loses its flavor if it travels too far from the source. Bill Klein, manager of the Babcock Dairy Plant at UW-Madison, told Mitch Teich of public radio station WUWM, "says that when it comes to eating custard or ice cream, the fresh stuff is always better. But why?" The short answer: ice crystals. "So when you think of soft serve coming out of the machine, it's got X amount of ice crystals in it and those ice crystals are a certain length in size. The quality of that ice cream at that point - whether it's soft serve or not - the quality of that ice cream is at its best. It only goes downhill from there," Klein explains. The longer ice cream or custard sits around, the longer the ice crystals get, which alters the way it tastes. "The key is to keep those things as small as possible and that's what makes it really smooth and creamy feeling," says Klein. As tempting as it might be to buy a pint (or a quart) to take home, Klein explained, leaving it in the freezer for too long "will cause the quality to degrade." Lesson learned: fresh but frozen, not frozen and refrozen.